THE HOHWALD unique site in Alsace is a small valley with a very quiet situation to get rested and rested. In this little corner of paradise are two small cottages built by the owner in 2007, with logs of spruce from the surrounding forest. For the sheets the tenant can bring his own sheets or rent them at 15 euro per person. For our friends dogs and cats there will be a supplement of 20 euro. See you soon in Alsace. The cottage has a high chair and a cot and a play area has outdoor for children. I propose a meal on order for the Saturday of the arrival, a specialty a baekaoffa to 20 euro with entry and dessert to 20 euro per pers. We spent a wonderful week here with our dog. We received a warm welcome from Jean Luc and his beautiful Briard. Our dog got on so well with her, chasing each other around the fields. The chalet was comfortable, homely and had everything we needed. The view from the balcony was stunning and we enjoyed the ever changing hues thoughout the day during our stay. There are so many birds around and we would fill up the bird table each morning so we could enjoy their comings and going over breakfast. Would recommend trying Jean-Luc's home made apple juice, its delicious. Walks lead right from the door and are extensive throughout the wooded hills which are filled with wildlife, birds of prey, wild boar and deer can all been seen mostly early in the morning. You can also walk off road over the hill at the back to the town which take about 15-20 mins but its just 5 mins in the car. There are castles, beautiful towns, vineyards and Patisserie Receveur at Barr is a must, their cakes are divine. Recommend going for lunch in Andlau which is beautiful, for Alsace onion tart and a glass of muscat. The nearby town has a restaurant, cafe and small shop for bread and essentials. The waterfall is also worth visiting and can be walked to from the town. We would definitely go back and stay again, would really like to see it through the different seasons. For us this chalet had everything we could want from our holiday. Thank you very much for the score you give to my chalet. I was happy to see that you spent a great week. It's a pleasure to receive English people for living this experience, where everyone can enjoyed wildlife and quiet places. Gastronomy is a great part also! Super geeignet um für ein paar Tage zu entspannen. Magnifique chalet rondin très bien équipé conforme a l annonce. Déco très joli .très bien placé pour visiter les sites important de la région. Merci a Jean Luc pour son accueil nous avons passé un ecxelent séjour. Merci pour votre appréciation je suis très content que vous avez passé une belle semaine , passé de bonne fête . Das hübsche Häuschen ist liebevoll eingerichtet. Alles wurde in vom Vermieter selbst gebaut, alles wurde aus Holz gestaltet, sogar die Handtuchhalter. Die Lage und der Ausblick sind einzigartig! Eine sehr angenehme und saubere Sache ist auch die Trockentoilette, ganz unkompliziert und sehr sauber. Vielen Dank für eine wunderschöne Woche ! 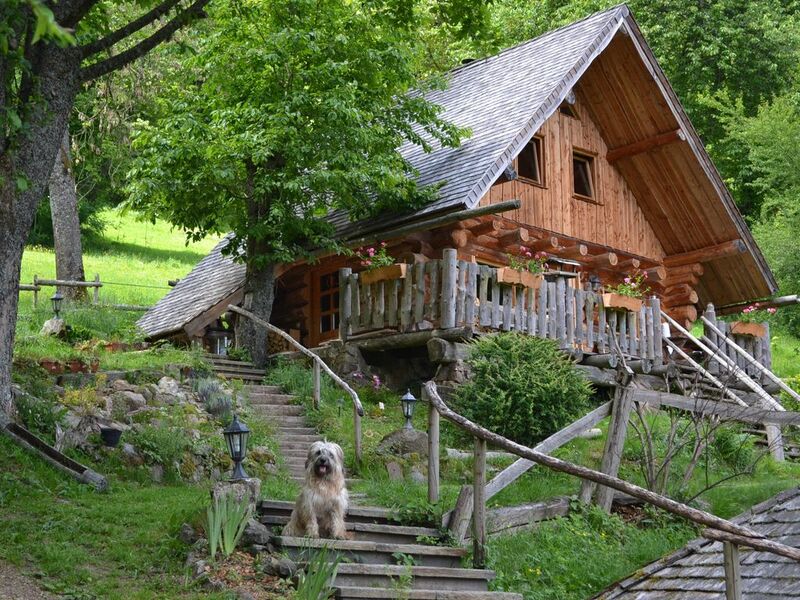 The chalet is located at an altitude of 550 m and 7 km of the road of Alsace wine and between Strasbourg and Colmar.